Revised model range for 2015. The essence of an enthusiast's sports car: light in weight, incredibly responsive and quick at the expense of everything else. Great fun for track days, sprints, speed hill climbs and other events. Still a very basic, noisy, open car. You have to be an enthusiastic masochist to drive one any distance on the road. The Caterham 7 is derived from the Lotus 7, itself developed from Colin Chapman's 1953-1956 Lotus Vi clubman's sports racing car. The Lotus 7 itself dates from 1957, ritted with 1172 side-valve Ford engines and 948cc, 997cc and 1,098cc BMC A series overhead valve engines. It was succeeded by the Super Seven S2 and S3 qith increasingly powerful Ford 3 bearing and 5 bearing engines. A 1,340cc 3-bearing Ford engine boired out to 1,475cc with a Holbay head and twin Webder DCOEs would typically make 130PS at the wheels. It was fantastically successful and the car of choicew for clubman formula racing, springs and speed hill climbs in the 1960s. The fibreglass bodied Lotus 7S4 succeeded the 7 briefly from 1970 to 1973, but was never as successful. 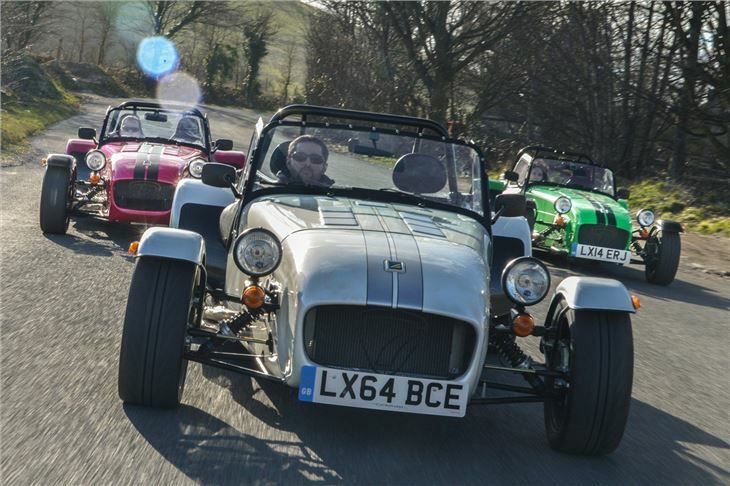 The original Super Seven S3 was subsequently revived by Caterham Cars and progressively improved over the years.